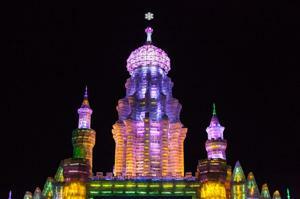 The 29th Harbin International Ice and Snow Festival is going on in Harbin, China. It started on January 5 and will last for over a month. It is one of the largest ice and snow festivals in the world. There are life-sized buildings carved out of ice that are lit up with colorful lights. It looks like a magical land of fairy tales with palaces, castles, ice slides, and even a zip-line. One of the star attractions this year is the “Crystal Castle” which is 160 feet (48 metre) tall. Harbin is nicknamed “City of Ice”, and there is a good reason for that. The average winter temperature in Harbin is -16 degrees Celsius (about 3 degrees Fahrenheit). Brrr – that’s cold!